It all happened several years ago when I fulfilled my dream of owning a large poodle. 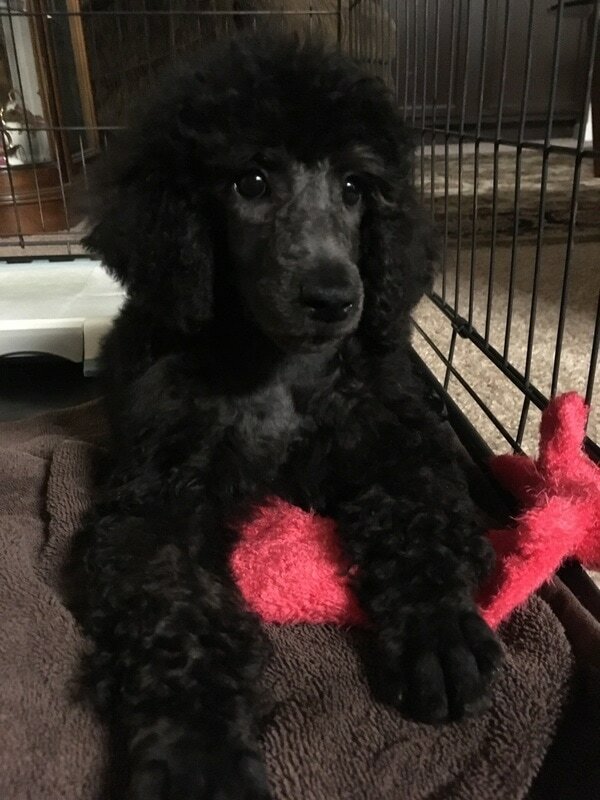 We had owned a teacup poodle before but I wanted a real dog. After all teacups should be for tea! I wanted something sporty, elegant, and playful all in one. So for years I dreamed of getting my coal black "Marie." One of the worlds oldest breeds! 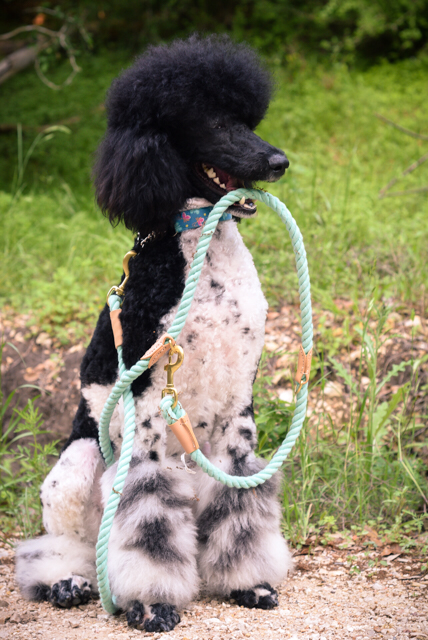 Standard Poodles are some of the best guard dogs around and one of the smartest dog breeds! Add that to some other older breeds to provide the best of breed traits and what dogs you have. We are planning a litter of F1 Sheepadoodles from outstanding European lineage! We are happy to announce our first litter of Bernedoodles and for our wonderful guardian family! We specialize in breeding lines for therapy dogs, PTSD and assistance dogs for seniors. Of course for the family pets as well! We work with our guardian homes to provide the best environment for pups and parents! Get on our waitlist $200 non-refundable fee which goes to toward the price of the puppy! Deposit balance due at birth. Waitlist forming for 2019-2020 lists. We are looking for Guardian homes. If you feel qualified to be a guardian home please feel free to contact us. We work together to expand our lineage while you gain a life long friend at minimal cost you! Guardian homes are awesome. 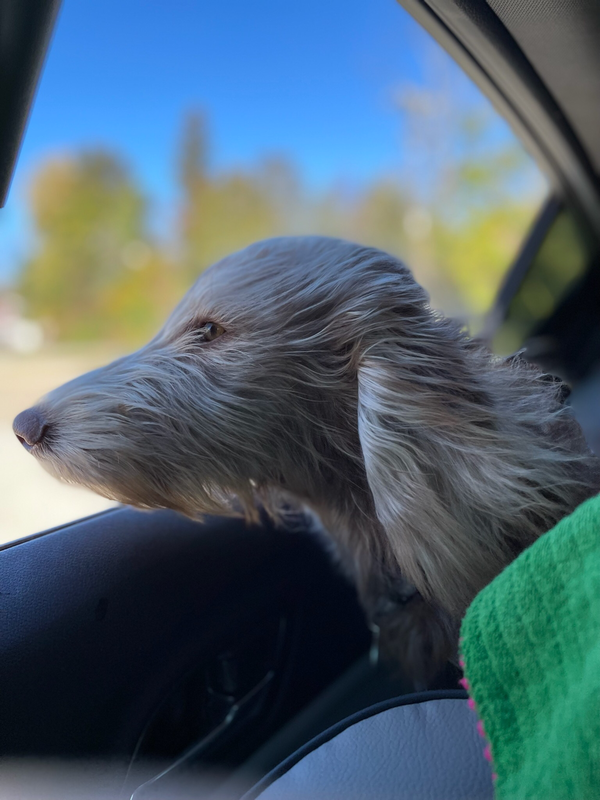 Whether you call them a Pudel like old Russian fisherman, or Pudelhund like the german hunter or the popular Poodle, it is the same smart, friendly, affectionate, and loyal breed of days gone by. 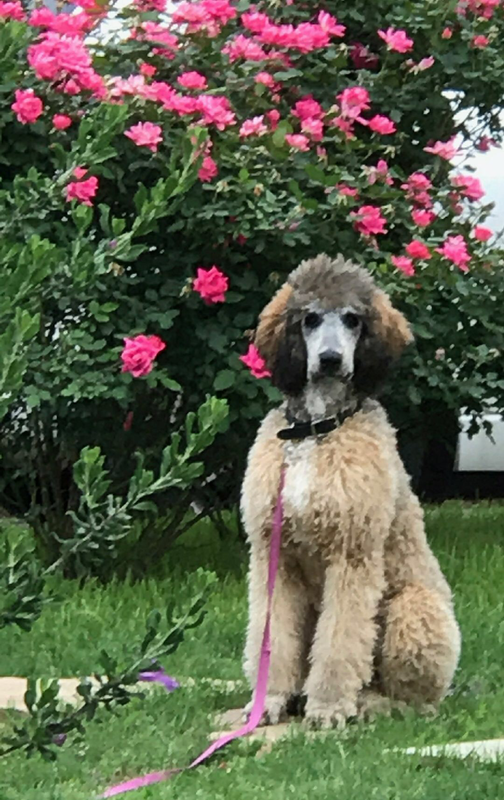 And by the way everyone will take credit for this wonderful breed, the French whom bred he Poodle down to tiny sizes, the Germans who loved them as companion and sporting dogs, and the Royalty of Europe whom only the finest had the wonderful Poodle as companion and hunting dogs. EARLY NEURO STIMULATED PUPPIES MAKE GREAT THERAPY DOGS!!! Early neuro stimulated puppies have been used in many government programs for their own trained dogs. This stimulation makes these puppies perfect for THERAPY & SERVICE DOGS. 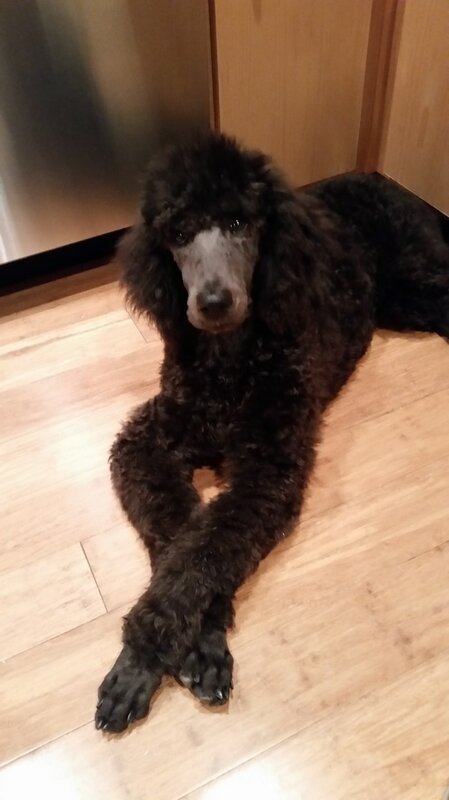 Not only are they extremely intelligent but the poodle has been known as the thinking dog. 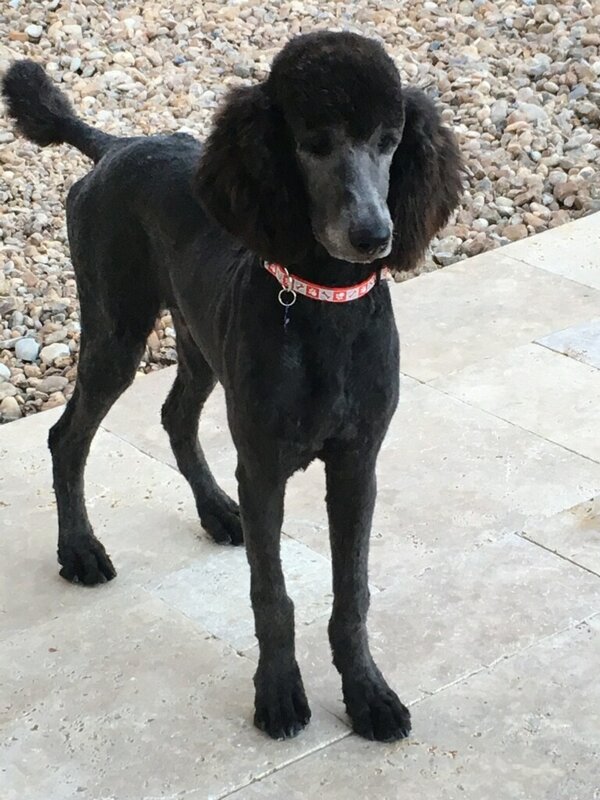 Many breeds take commands, but poodles actually will give the situation some thought, even with training, poodles think about what can be the best solution. These are just amazing dogs! WE ARE HAPPY TO DO A VOLHARD TEST FOR YOU IF YOUR LOOKING FOR A SERVICE DOG! 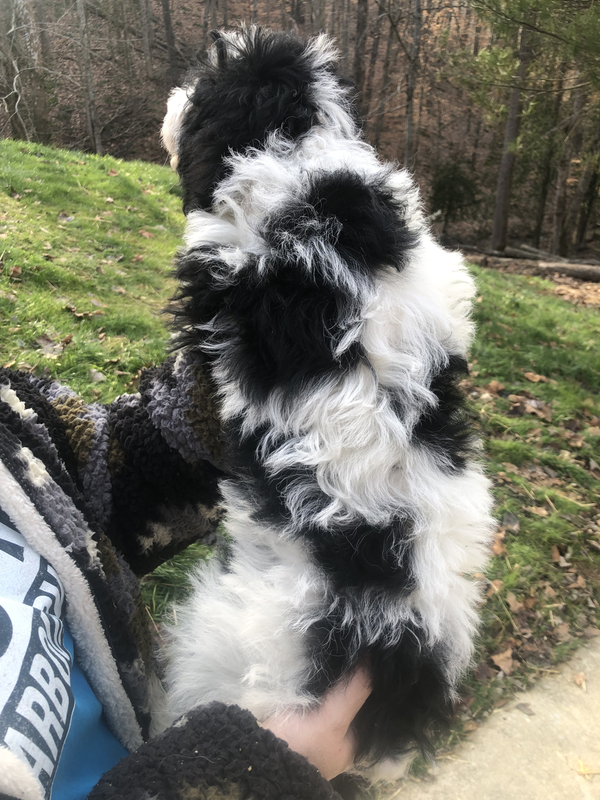 SHEEPADOODLES, POODLES AND BERNEDOODLES WE ARE TAKING A WAITLIST FOR LITTERS. WE ALSO PARTNER WITH A FEW QUALITY LABRADOODLE. Olde English Sheepdogs are considered one of the dying breeds. However anywhere we take Oliver everyone wants to know what kind of dog is that and where can we get one. 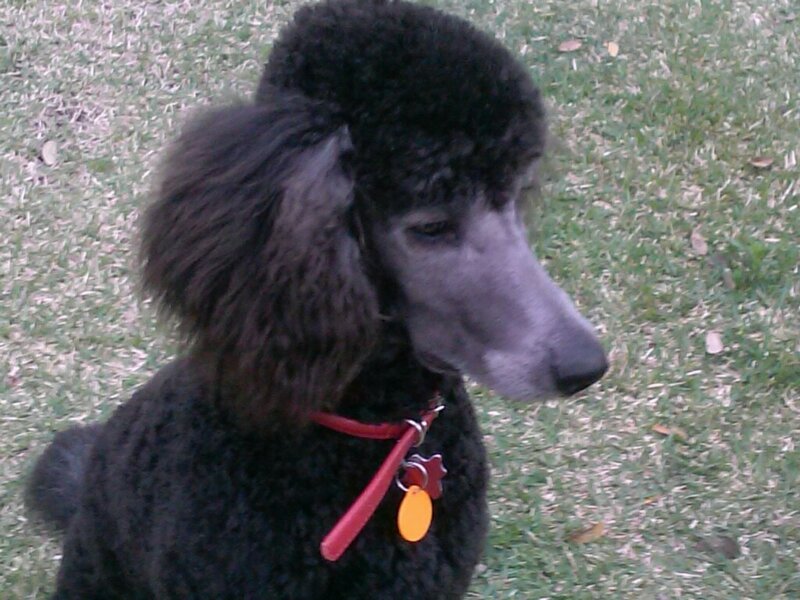 The hybrid with a poodle creates a low shedding highly intelligent breed. Sheepdogs are not aggressive but herd owners away from danger. Just love them. We are creating a waiting list! We are a very small hobby breeder and utilize Guardian homes. Health Guarantee! Our pups have the best vaccine protocol, high titer Neopar and Neovac. Kept clean. Ever tried to potty train a kennel or farm pup? They have learned to potty where they stay. Home raised because we have a couple and don't need a kennel. We don't sell to stores, breeders, or puppy mills. We do have an info sheet, we care about the pups we produce so we need to know about you as well. Thanks for understanding. Absolutely no shipping but you are welcome to fly into a local airport, which is about the same as shipping, to accompany your new pal home. 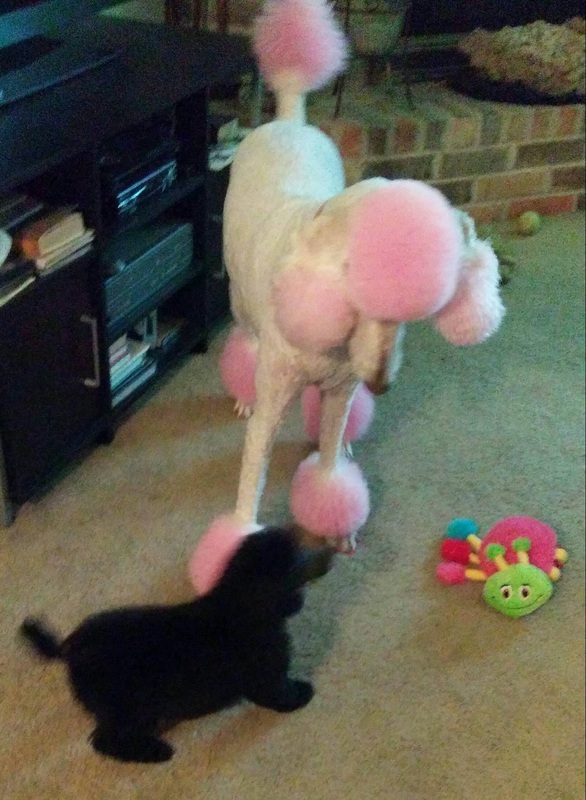 This little gal is having fun with her new sister, definitely pretty in pink! 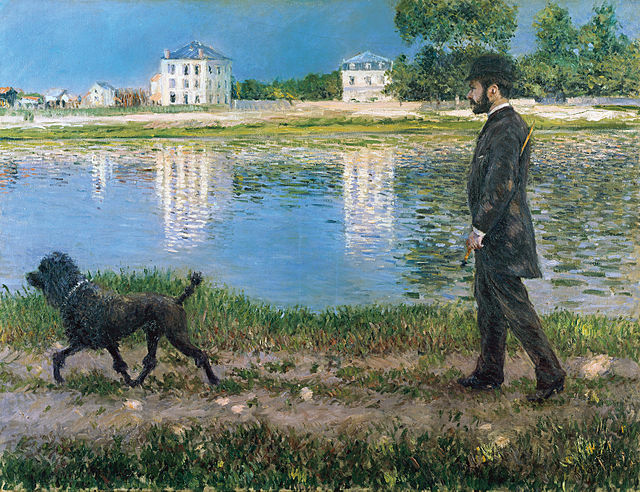 Poodles have been around for a long time - Check out 100 year old art work below available from public domains. POODLE & SHEEPDOG STUD SERVICE AVAILABLE - REASONABLE PRICING. DOODLE FRIENDLY! CURRENT BRUCELOSIS TEST REQUIRED. WE CAN ARRANGE FOR GUARDIAN MALES TO BE AVAILABLE AS WELL. Charlie at home with family. He’s a heart stealer! OUR STUNNING BALLET IS ADOPTED. HOW DOES OUR RETIRED DOGS LIVE? CHECK IT OUT. SHE IS LIVING THE GOOD LIFE ON ISLA MUJERES, MEXICO. OUR DOGS HAVE A SHORT BREEDING LIFE TO EXTEND OUR GENETICS AND LINES. WALTER - ISN'T HE STUNNING? This guy always loves his toys and loves it when he gets a new one! THIS IS LENNY AND HE JUST GRADUATED HIS FIRST ROUND OF TRAINING!!! This is Queen! Isn't she an amazing looking. 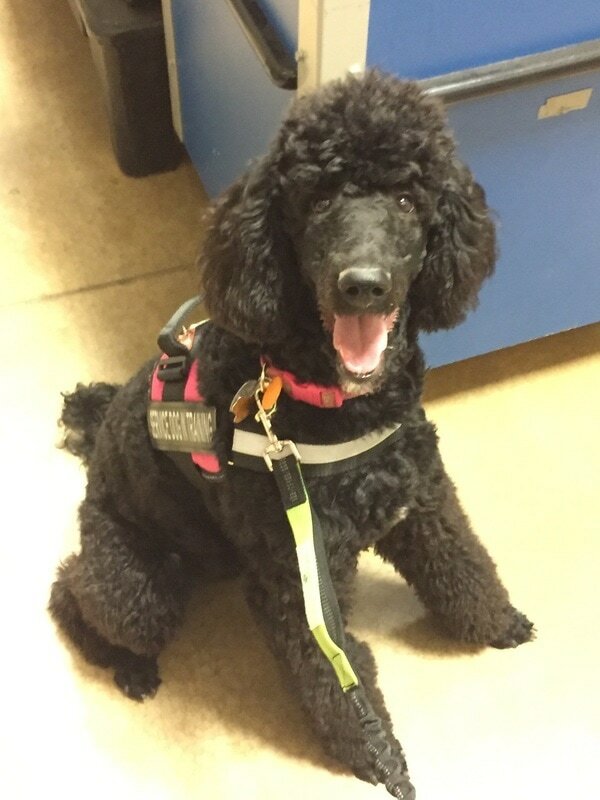 She is growing up and being trained as a service dog. We're proud of you Queen! San Antonio Rosie is queen of the castle!